Priscilla Silvas wanted to go to college. But like many high school students, she had limited knowledge of the road to get there, and even less idea how to pay for the rocketing cost of tuition. As a senior at Holland High School in 2010, Silvas didn’t apply for a college scholarship -- until a guidance counselor suggested the Holland/Zeeland Promise, founded and funded by a local auto dealer and a small group of fellow West Michigan business leaders. After scrambling for a ride and bickering with her then-boyfriend, Silvas arrived frazzled and frustrated for the scholarship’s application test, which measures personality traits such as motivation. The four-hour process did nothing to improve her mood. “I walked out thinking it was a waste of time,” she said. Hardly. Silvas was one of three students to earn the inaugural Holland/Zeeland Promise. Based largely on financial need, the scholarship supplements any other grants or scholarships to cover the full cost of tuition, books and room and board for four years. In Silvas’ case, that adds up to more than $13,000 each year to attend Davenport University in Grand Rapids, where she’s studying to become a medical assistant. Stories such as Silvas’ are precisely what Bob DeNooyer and his wife, Colette, envisioned when they helped launch the Holland/Zeeland Promise by pitching in the first $10,000. The scholarship is intended for high school graduates in Holland and Zeeland who have financial need, have earned between a 2.5 and 3.5 grade point average and, perhaps most importantly, display strong motivation and academic potential. Applicants must participate in one of four local youth organizations, including Hope College’s Trio Upward Bound and the Boys & Girls Club of Greater Holland. DeNooyer relies on counselors’ recommendations and personally interviews the students. The Holland/Zeeland Promise currently supports eight college students for four years apiece, and plans to add another five students this spring. Members of the current crop of students are attending Davenport, Ferris State, Michigan State and Grand Valley State universities as well as Hope and Baker colleges. To date, the scholarships have ranged from $1,000 to about $13,000 per year. DeNooyer hopes to eventually raise enough private and corporate financial support to make four-year commitments to 20 students. The DeNooyers modeled their program on the Kalamazoo Promise, which in 2006 began offering four years of college tuition and fees for Kalamazoo high school graduates. Lacking major donors such as those who anonymously started an endowment for the Kalamazoo Promise, DeNooyer first pitched a 1 percent city income tax increase as a primary funding source. That idea failed to gain traction. “That bombed,” Bob DeNooyer said with a laugh. Undeterred, DeNooyer decided to put up the first $10,000 and began soliciting friends, family and business colleagues for $1,000 contributions to form a pay-as-you-go scholarship. Holland/Zeeland students renew their scholarships each year by fulfilling the requirements of the college they’re attending, completing classes and maintaining “good” grade averages. After a solid freshmen year, Silvas struggled initially as a sophomore, in part because she began living on campus. But she’s back on track academically and determined to maximize the opportunity she’s earned. 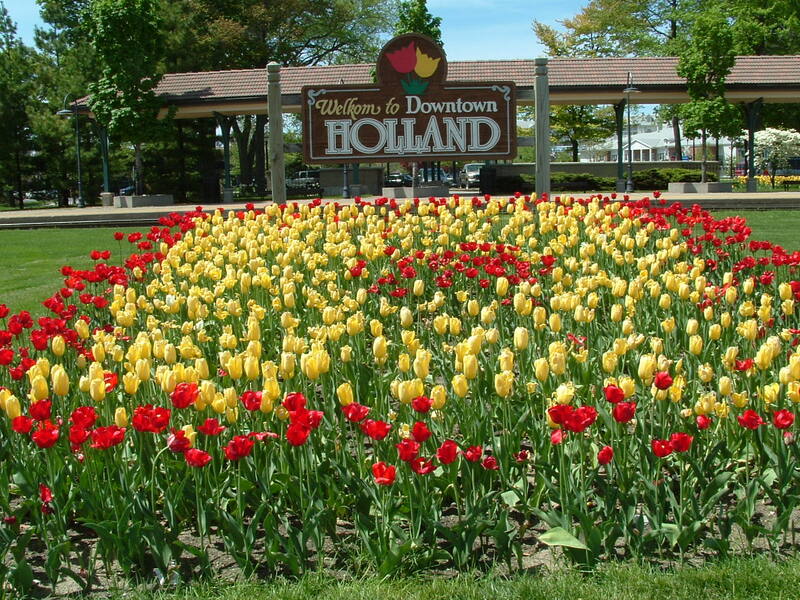 To learn more about the Holland/Zeeland Promise, visit www.hollandzeelandpromise.com. Todd Schulz is an award-winning freelance journalist who has worked at several Michigan newspapers, including the Lansing State Journal. A Saginaw native, his work has appeared in numerous publications, including USA Today and Michigan History Magazine. Questions (1) Are the contributions for scholarship funds charitable contributions? (2) Do the college students have to maintain a B average to continue the scholarship from one semester to the next?